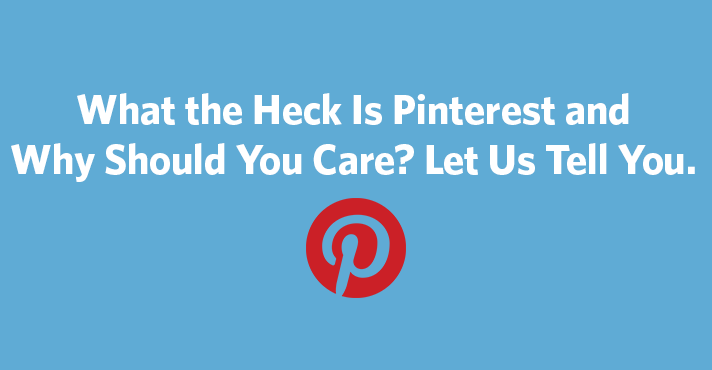 What the Heck Is Pinterest and Why Should You Care? Let Us Tell You. New tools and platforms come and go rather quickly in the social media world, but the focus on Pinterest over the last five years is not unwarranted. This is a social network that’s actually worth paying attention to. Why? Well, among other reasons, Pinterest grew by 97% in 2016 and has 150 million monthly active users, making it one of the fastest growing social networks. In the U.S., users are overwhelmingly female at 60%, but more men are joining the site – 40% as of 2016. Either way, people who use Pinterest are a passionate, addicted bunch who just love talking about the site. Need more? Check this out: Pinterest drives three times more web traffic to other sites than Google+, Twitter, LinkedIn, YouTube, Reddit, and StumbleUpon combined. That’s right — combined. Similar to Reddit or StumbleUpon, Pinterest is like a virtual bulletin or cork board that allows users to find and curate images and videos. Unlike other photo sharing sites, the emphasis here is on the discovery and curation of other people’s content, not storing your own. This is certainly right on trend with social media’s continued emphasis on visual content. Content with images gets 94% more views than content without. Pinterest allows you to use visual assets like photos or infographics as a type of social currency in their own right — garnering likes and “repins,” the equivalent of shares or retweets — instead supplementing web pages, blog posts, or other text-based media. You can easily post images from other websites to your Pinterest account using the “Pin it” task bar button, or you can just browse the Pinterest platform to discover, like, or “repin” content others have already posted. This visual aspect of the site is one reason why it’s captured the interest of so many businesses, from retailers to photographers and designers, who are using it as a portfolio or product catalog. Customers and clients can say which products they love (shoes, bottles of alcohol, furniture … you name it) and want to buy for themselves, and their friends can further the endorsement by pinning the pictures to their own boards. How do you keep all your interests separate? Under each Pinterest account, you can create and curate multiple boards. This is an interesting solution to the problem of having one social media account, but various interests. For example, many people manage two Twitter accounts, one for business and one for pleasure. But on Pinterest, you can curate boards that are totally unrelated and it doesn’t unnecessarily clutter your followers’ streams. That’s right, you follow people on Pinterest (like you follow people on Twitter) but you can choose to follow all of a user’s boards or just one — so that you can find the content that’s most relevant to your interests. This type of followship up-ends the Facebook model where content segmentation lies in the hands of the Page or Profile only, not the friend, fan, or member. Can you control who can pin to your boards? Yes. You can create boards that only the admin can pin to or boards that allow the admin and other specific people to pin. Or you can create a community board that anyone can pin to. This multi-tiered curation model under a single profile is unique to the platform and one of the reasons why I believe Pinterest has captured the imagination of social media nerds (like me). So what should a small business do with Pinterest? You can join Pinterest as a business which gives you metrics to see what content from your website is most popular on Pinterest. I recommend that you get comfortable with the platform as a user first, and then use that knowledge to work on your business presence. One thing you can do now is to use the site to get inspired: All that visual content will surely bring to mind ideas for marketing campaigns, photos, products, and other content. Sign up, browse around, and let the site help you brainstorm your own projects. Need content ideas for Pinterest? Check out blog posts, videos, and more for ideas on what your small business or nonprofit can pin to drive traffic and increase sales. And follow Constant Contact on Pinterest – we pin tips and best practices on the marketing trends you need to know about, including Pinterest marketing and email marketing. Former social media manager at Constant Contact, Erica develops and executes strategic social business and communications programs.